POPE VALLEY — Aetna Springs Resort is a time capsule, a 19th-century relic of Napa County history stashed away in this remote valley where the open landscape resembles museum photos of the old American West. As layers of sediment can connect geologic history, Aetna Springs serves as a link to horse-and-buggy days. Walking through the faded grounds today, it’s easy to imagine vacationers from San Francisco arriving by train in Calistoga in the 1870s — when the resort opened — and taking a carriage over the rutted Oat Hill Mine Road into Aetna Springs. A trail remnant still stops in front of one building. The smell of sulfur still hangs in the air, a pungent reminder of the mineral springs that drew the early visitors. Peek into the cottage of screenwriter Frances Marion, one of the most powerful women in film history, and picture her escaping the hubbub of Hollywood in the 1920s to relax for the summer at her father’s resort. Stand on the steps of the dining hall and imagine Ronald Reagan announcing his candidacy for governor at that very spot in 1966. But time has not been gentle to Aetna Springs. Its buildings are worn; some are so dilapidated their roofs are collapsing, while others seem to hang precipitously close to the shifting banks of Aetna Springs Creek. The property hasn’t been used as a resort since the 1970s. That’s about to change. The new owners, developers Robert Radovan and Bill Criswell, aim to restore the property to its historic luster and use. The Napa County Planning Commission signed off on Radovan’s restoration plans last month, allowing him to move forward with the project. He said he hopes to have a design completed by this summer, then break ground, with the resort opening by 2014 or 2015. Radovan and Criswell purchased the property, which includes a nine-hole golf course, in 2006. In 2008 they restored the golf course, which dates from the 1890s and is believed to be one of the first built west of the Mississippi. They set their sights on restoring the resort, but doing so required a history lesson. In the 1970s, the resort was sold to a company affiliated with the Rev. Sun Myung Moon’s Unification Church, and later to a Southern California developer. He tried to get approval for an expansion of the resort, but failed to muster enough support to pass a countywide Measure J vote, Radovan said. Measure J required a public vote when properties in agricultural zones want to convert to commercial uses. Criswell and Radovan suffered a defeat of their own in 2009, when the county Planning Commission rejected their Lake Luciana project, which would have installed an 18-hole championship golf course and created luxury residential sites in Pope Valley. Commissioners objected to the planned conversion of land in the Agricultural Preserve to a non-agricultural use. 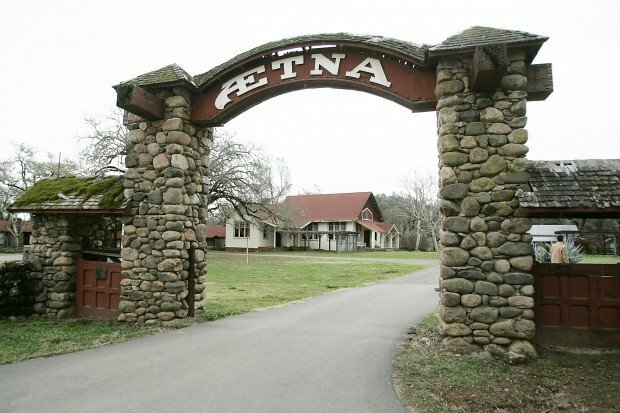 The owners’ plans for Aetna Springs had to conform with the property’s historic use. Last year, they applied for a major modification of the site’s use permit to allow them to move five buildings away from the creek, move a swimming pool, restore a bridge, and construct a new building at the site of the original owner’s house, which burned down decades ago. The commission approved that work. “Ninety-nine percent of every structure retains its original use,” Radovan said. He said crews will deconstruct some buildings, reuse what materials they can and put them back together. Some woodwork, made from California redwood, has stood up so well it won’t need more than a fresh coat of oil, he said. All guest rooms will have modern accommodations, he said. They plan to restore each building so that it will become a family-friendly, 65-room resort with 120 employees, 100 overnight guests on weekdays and 200 overnight guests on weekends. Their goal is to offer guests an escape to the country for golfing, hiking, horseback riding, fishing or lying by a swimming pool. What will draw vacationers an extra hour’s drive from Napa? The myriad activities Aetna Springs can offer families, especially children, and its history, Radovan said. Developing the resort has allowed Radovan to delve deep into its history, and he’s well-practiced at reciting it. He points out the different architectural styles of the buildings, which vary from Victorian to the styles of architects like Bernard Maybeck and Albert Farr. As the resort expanded, old buildings were modified with new architectural styles, and new ones were constructed around them. He said the resort’s original owner, Len D. Owens, Frances Marion’s father, built it up so that by 1900 it had became one of three hot travel destinations in the Bay Area for San Franciscans and others throughout California. “A case of Aetna Springs mineral water cost more than a case of brandy,” Radovan said. After Marion built a name for herself in Hollywood, she and her friend, the actress and filmmaker Mary Pickford, would spend time at Aetna Springs and draw the Hollywood set with them, Radovan said. “The fact that you were further out was part of the draw,” Radovan said. In 1945, the resort was sold to George Heibel, a Texas native who started his career with a dishwashing job at the Biltmore Hotel in Los Angeles, said his daughter, Helen Heibel, who lives in St. Helena. He left the Biltmore for San Francisco and worked his way up in the hospitality industry there, she said. By the time Owens was looking to sell, George Heibel was respected enough for Owens to trust him with Aetna Springs. Pope Valley’s open country appealed to her father’s Texas roots, Helen Heibel said. Heibel said her mother, a second-generation San Franciscan, would be overwhelmed by the summer heat and would have to escape back to the cool fog of the bay. Heibel said she grew up with her four siblings at the resort, loving to swim and ride horses. She eagerly awaited the start of every summer when friends she had made the year before would return. Living on the resort also meant working seven days a week during the busy season. Time has given her more of an appreciation of it, she said. She said her dad, a deputy sheriff, was also well-connected in the Republican Party, frequently bringing important political figures out to the resort for stays. He became the chairman of the Napa County Republican Central Committee at a time when the county had many prominent Republicans. George Heibel inevitably came to know Ronald Reagan, Helen Heibel said. When Reagan sought a place to declare his candidacy for California governor, Aetna Springs seemed like a good fit, she said. George Heibel sold the resort in the 1970s after it became too expensive and time-consuming to run, she said. She said she still visits the resort today, but it’s difficult for her to see it in its current state. She said she supports the work Criswell and Radovan are putting into restoring it. “It’s about time,” Heibel said. “I feel very good about what they’re going to be doing. And those 120 workers will live where? It is disappointing this article contains no information on the developers plan to accommodate workers on site. Does this development in fact pressure the rural village of Angwin to house their workers? Will workers traverse the winding, slick, foggy, black ice coated Howell Mountain Road back home? Once again, developers cream the cash off our culture, history, environment and leave the citizens to fund their low income housing needs. Shame, Shame, Shame! Every year until my father passed away in 1971, our family would spend a week at Aetna Springs. It was the only vacation I knew until reaching adulthood. I have so many wonderful memories there - and many aging photos as well. My favorite activity were the horseback rides led by Linda Heibel, who shared the same birthday as my older brother. She was to become the object of my first school-boy crush. George and Ruth Heibel and all their five children were very involved in the day to day activities and always made you feel more like family members than guests. If Aetna really does reopen, I hope to be one of their first guests. This would be a wonderful place to stay, old school, I remember hearing about it. The Dining Hall looks wonderful in the picture, let it open without any problems. I think this is great. More of these landmarks need to be restored and made functional.Somehow I have this feeling that the enviornmentist will get involved and file a lawsuit to throw a "monkey wrench" into this fine project. I sure hope this does not happen, but I wouldn't bet any money on it. WRONG! And how did you determine that they had more money than brains? Awesome, can't wait to see the finished version. Finally, something besides grapes! It’s going to take a massive amount of money to get anywhere near close to original condition at a reduced scale even. Twenty some years ago it was millions and they’ve deteriorated considerably since. They say on a bright full moonlit night, Ghostly priests are seen walking across the golf course of this establishment. I hope this historical landmark can and will be restored to it's former glory for locals and tourists alike to come and visit and remember it's glory days of a Napa long ago.